If you've seen some of my earlier postings you will probably recall that Hamilton used "B" designations to identify when a model had a significant change versus prior models - usually a change in movements. Sometimes the B designation was shown in the catalogs and sometimes it wasn't. 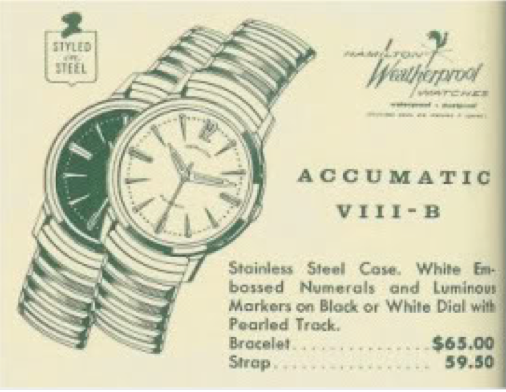 One of the times it was shown was with the Accumatic VIII. 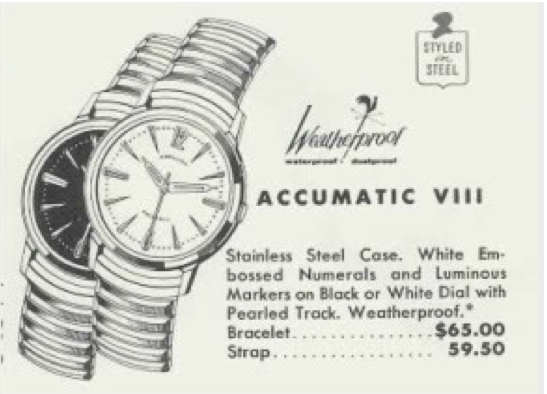 The Accumatic VIII was introduced in 1959 and then two years later the Accumatic VIII-B replaced it. Looking at the catalog images, it's not really clear what changed so I'm going to guess it's the movement inside. 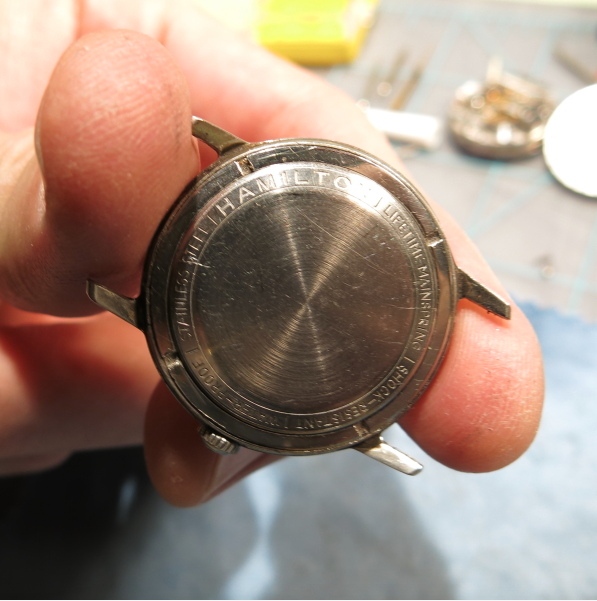 As you can tell from the descriptions, the model came in a stainless steel case with a choice of dials, white or black. 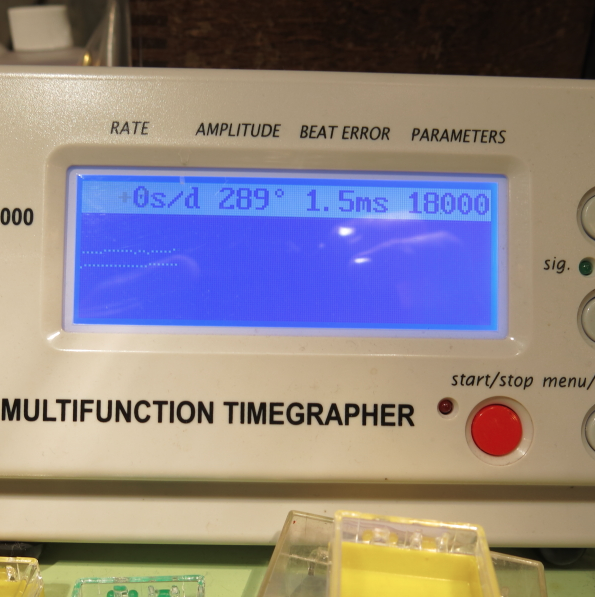 The dial and hands have luminous material applied to glow in the dark. I'm not sure what movement should be inside the VIII or the VIII-B - so that's a bit of a mystery. However, I did recently pick up what I believe is an Accumatic VIII (or B) and it has a Swiss-made Hamilton 679 movement inside. The 679 is an uncommon grade, as far as I know. In fact, I've only seen this one. 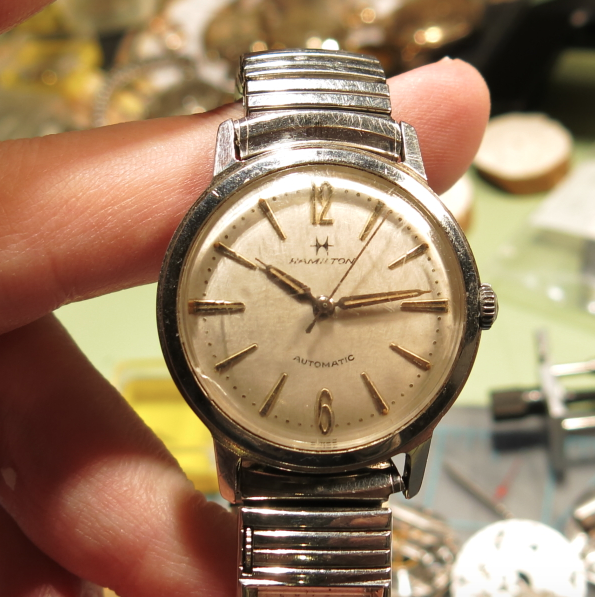 It's based on an ETA 2465 automatic which dates back to 1955 so it's in the right era (late 1950's / early 1960s). As received, the watch was in decent overall shape. 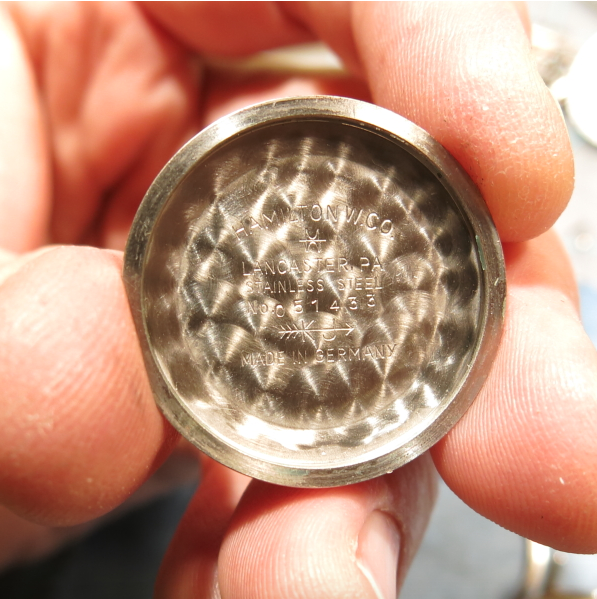 Stainless steel cases can usually withstand a beating better than gold filled or plated cases. The watch came on a Speidel expansion bracelet with a scrolling calendar window from 1972, which was interesting to see. The case has a stainless back like a dinner plate that is held in place with a threaded ring. The inside of the case back says "Made in Germany" - another first for me. I don't recall ever seeing that before. 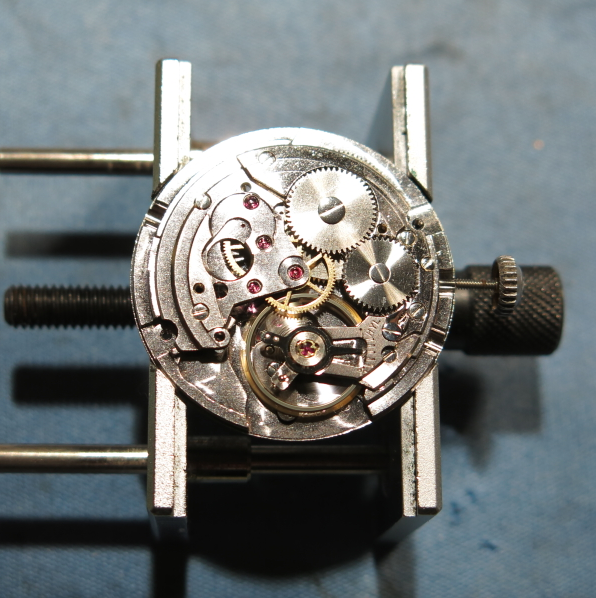 Here's the 679 movement inside the case, held in place by a movement ring with a gasket on top to seal against the back "plate". While all the parts are being cleaned, I'll turn my attention to the crystal. This one is scratched up and cracked so it will need to be replaced. 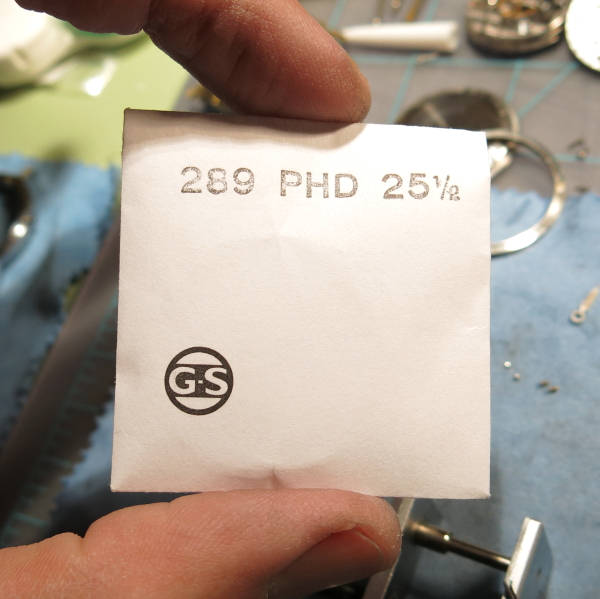 GS PHD-style (high dome) are my usual go-to choice for replacing crystals. 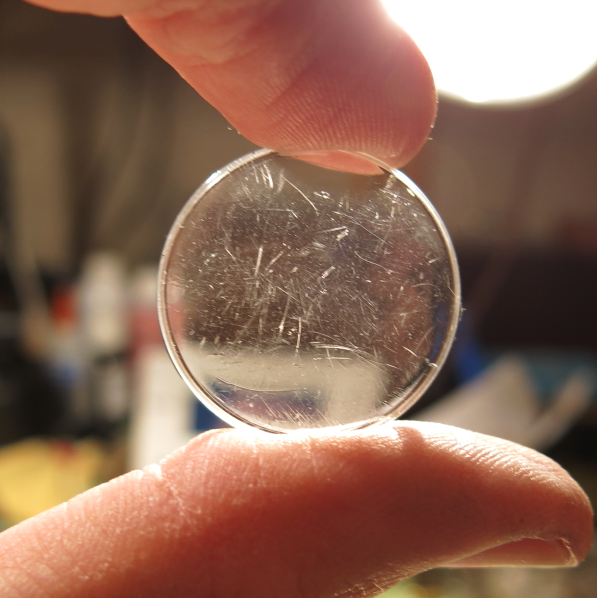 The number on the left is the diameter in millimeters (28.9). The other number is the GS size. They go in 1/4 increments so the next size is a 25-3/4. 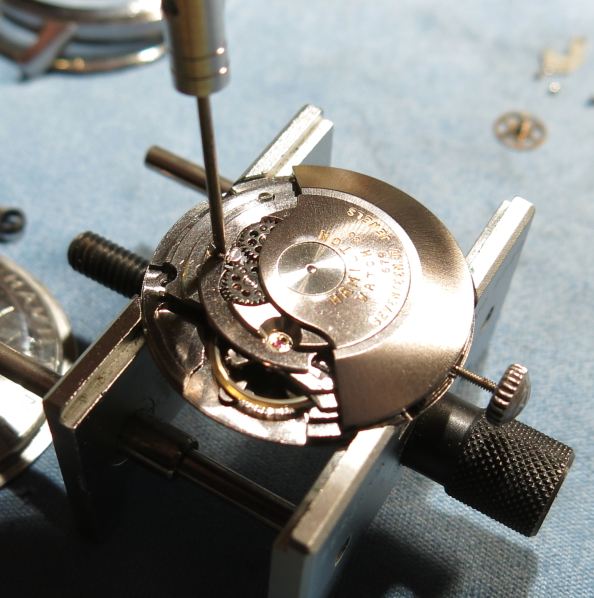 You need to measure the bezel opening and then add a little, as the crystal is compressed into bezel opening with a special tool. All the parts are now cleaned and dried so they are ready to go back together. When the rotor is not installed, the movement is your basic manual winding movement - so you can wind it up and get it running before the rotor goes back on. Here you can see the balance spinning away. 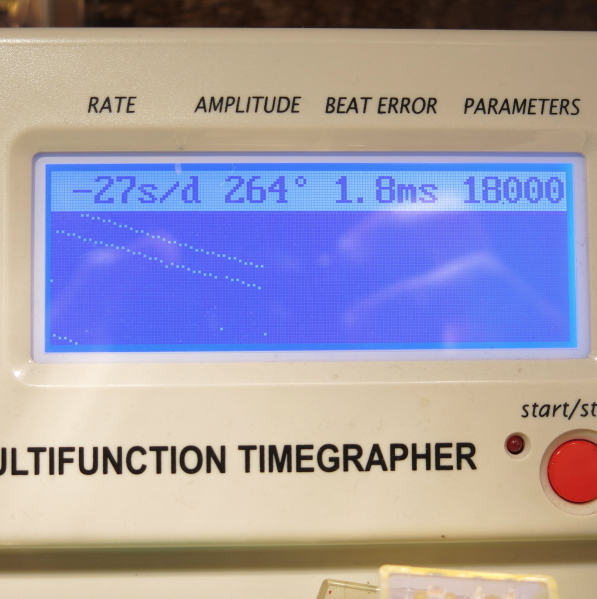 Uh-oh… based on my timer something is going on in the balance to make some "noise". It could be dust, lint or something along those lines. I'll have to pull the balance off and re-clean it. Ah, that's more like it. Now the noise is gone but it's running a smidge slow. A little tweaking to the regulator gets the timing to be just right. The beat error of 1.5ms is not too bad. It could be better, or it could be worse - but it's not easily adjusted on this watch so I'll call it "just right". 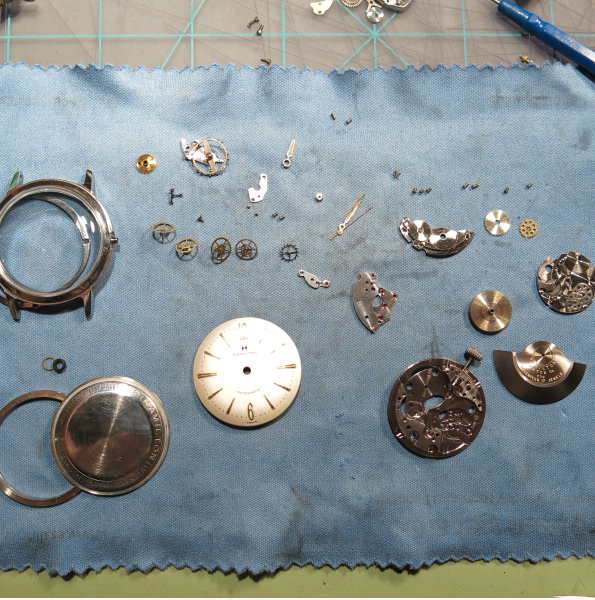 Two screws will hold the rotor assembly onto the back, once everything is lined up so the gears will wind the watch. And here's the finished product all polished up with a new brown leather strap. The catalog ad says the numerals and markers should be "white" but this dial looks more yellow to me. 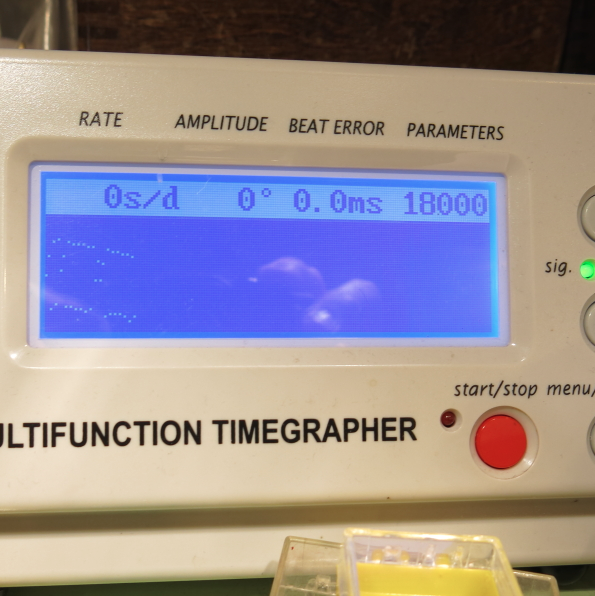 There was no indication that the dial was redone so I'm not really sure what's going on there. 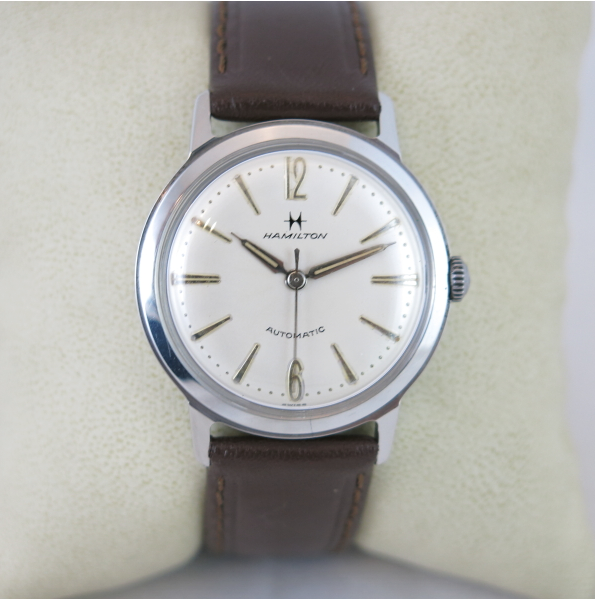 The Hamilton logo is straight, where the catalog says it should be curved - it could be that I've misidentified this watch but I'm fairly sure it's an Accumatic VIII. Feel free to let me know what you think it is. UPDATE: I now think this is a 1962 VIII-B. 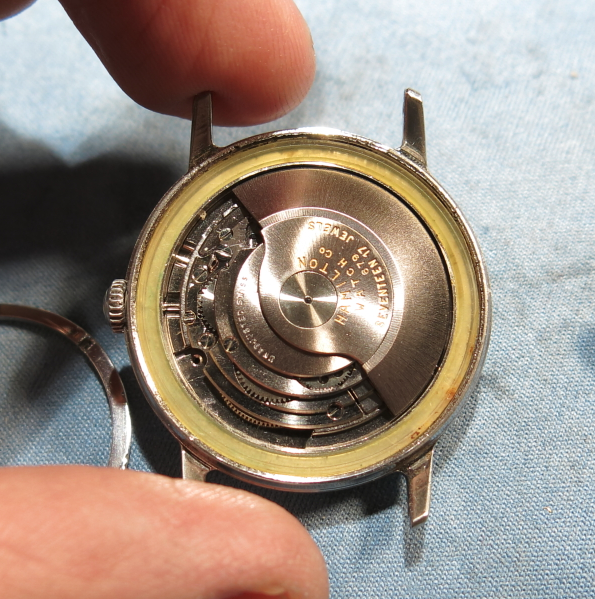 Check out the 1962 catalog image and the shape of the Hamilton logo on the dial. Excellent write up on a great restore!. I just found out this is the watch I have. Great work Dan. !